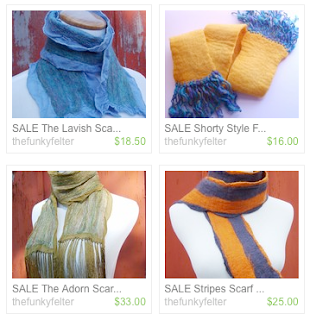 The Funky Felter: Scarf SALE!! Several Handmade Felted Wool Scarves Now 40 - 60% off my Original Prices! Yippeeeee!! Scarf SALE!! Several Handmade Felted Wool Scarves Now 40 - 60% off my Original Prices! Yippeeeee!! I have reduced the price of several of my handmade felted wool and wool/silk scarves. Just click here to see what is currently available in my Etsy shop. They would make a great cold weather holiday gift.